We’re dedicated to you while you’re here and after you leave. Follow-up care is extremely important. Your treatment team will remain in contact with you and your referring physician after you’ve completed treatment. We focus on giving you what you need to return to a normal life as quickly as possible. After your radiation therapy ends, you will need regular doctor visits to check your progress and help you deal with any problems that arise. This phase of your treatment is called follow-up care. Your follow-up care will include checking the results of your treatment, as well as appointments with your urologist. For a short time following your therapy, you will need to continue some of the special care used during your treatment. For instance, if you have skin problems after your treatment ends, be gentle with your skin until all signs of irritation are gone. Also, you may need extra rest while your healthy tissues are rebuilding. You may need to limit your activities to conserve energy and not try to resume a full schedule of activities right away. If you have stopped working, you can return to your job as soon as you and your doctor believe you are up to it, even during radiation therapy. If your job requires lifting and heavy physical activity, you may need to change your activities until you have regained your strength. When you are ready to return to work, learn about your rights regarding your job and health insurance. If you have any questions about employment issues, contact the American Cancer Society at 1-800-ACS-2345. After treatment, you are likely to be more aware of your body and slight changes in how you feel from day to day. If you have any of the problems listed below, tell your doctor at once. This booklet has been created to help you understand your disease and how the treatment team at the Prostate Cancer Center collaborates with your urologist in curing your cancer. 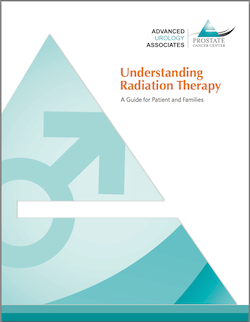 Additionally, the booklet is designed to answer your questions and those of your loved ones about the treatment of prostate cancer with radiation therapy.